Was "Ju-Jitsu Girl" the first ever super-heroine? In real life, Florence Gardiner (c. 1891-?) was a pioneering advocate of Asian martial arts as feminist self defense. 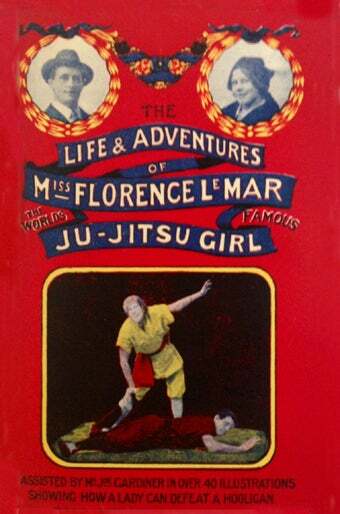 Her theatrical and literary alter ego, "Florence Le Mar, the Ju-Jitsu Girl" may just qualify as one of the first superheroines. Florence and her husband, professional wrestler and showman Joe Gardiner, toured vaudeville theaters throughout New Zealand prior to the First World War. Their signature act showed audiences how a Lady might defeat an aggressive Hooligan (mugger) via the skilled application of jujitsu. In ‘The Hooligan and Lady’, they are smart, clean, clever, straight. No act in this world is better – fast, and strictly up-to-date. When she knows the locks and holds – pertaining to the art Jitsu. When attacked, if they but study Miss Le Mar at Ju Jitsu. These techniques were also explained and illustrated in Florence’s book, The Life and Adventures of Miss Florence Le Mar, the World’s Famous Ju-Jitsu Girl, which is undoubtedly one of the rarest and strangest self defence manuals ever written. In addition to jujitsu lessons, the book offered a great deal of feminist polemic and a series of six fantastical tales describing her hair-raising adventures as the Ju-Jitsu Girl, taking on desperadoes including opium smugglers in Sydney, crooked gamblers in New York City and an English “lunatic” who believed he was a bear. The Jujitsu Girl defended the weak and innocent, solved crimes and punished villains through her mastery of the martial arts, pre-dating comic book superheroines like Lady Luck, Black Canary, Phantom Lady and Wonder Woman by nearly three decades. Though not without charm, these short stories have the sharp corners and hard edges typical of early 20th century dime novels. They are also undeniably theatrical and, in combination with Florence’s biography and her fierce feminism, inspired the production of a play, The Hooligan and the Lady, which was a hit at the 2011 New Zealand Fringe Festival. Florence’s heroic “Ju-Jitsu Girl” persona is also featured in the upcoming graphic novel trilogy Mrs. Pankhurst’s Amazons, in which she is a member of a secret society of radical London suffragettes who protect the leaders of their movement from arrest and assault. Mrs. Pankhurst’s Amazons is due to be published in early 2014 by Jet City Comics, a new imprint of Amazon Publishing.